Our current Model A is the second in our family; the first was a 1930 Standard Coupe bought from a Polaroid back in 1973 (when I was 13 years old). We actually intended to drive that first A back to the San Fernando Valley from China Lake, far away in the Mojave Desert (dumb!). My folks ended up paying a local hayseed $25 to haul it to our door on a flatbed! I eventually did a frame off restoration of the mechanical parts and learned most of what I know about old cars from that experience. I fondly remember learning to drive a manual stick shift on that car going round and round in a cul-de-sac! We sold that car many years ago. The second and current Model A (a 1931 Cabriolet pictured below) was purchased at the Rose Bowl antique car swap meet back in December 1978 and was featured in an article from Antique Motor News (attached). Turns out that we are the third owners of this car; the guy that we bought it from said that he bought it from the original owner who used it as a daily driver back in the early 70’s. The second owner obtained an old Model B racing engine from Wes Cooper, who ran a hot-rod shop back in the Burbank/Glendale area and swapped out the original, worn out, old motor. Mr. Cooper was a famous NHRA racing luminary from the late 1940’s well into the 50’s. The racing engine has insert bearings, a vintage Cragar OHV head (original from the late 1930’s —and not cracked! 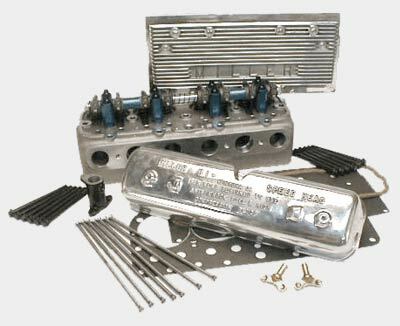 ), counter-weighted crankshaft, lightened flywheel, V-8 clutch, full pressure oiling to the mains, Stromberg 97 downdraft carburetor with headers, and a 12V alternator system. Other than for the 12V system, the car is hopped up as one would in the late 1930’s. Currently, I am installing a new radiator and recently had the mechanical brake system, front-end and steering box completely restored as new. After have a fan fly apart a few years ago (little damage done, lucky!) I purchased the repop pump from Miller hi-speed head company and modified a plastic fan hub to take a modern flex fan. Now it’s rock solid and blows like a typhoon. The engine runs super cool (oh…, and also after installing that new Brassworks radiator!). With the racing engine, I estimate getting about 100hp to the wheels. While it will go up to 70mph on the flat and level, I seldom go faster than 45-50 and I almost never drive the freeways. Everything except the engine is entirely stock Model A, including the transmission and rear end, which substantially limit my top-end speed. This is A-Okay with me since it has stock mechanical brakes, suspension and steering. I never go faster than I can safely stop! Then again, every once in a while I start dreaming about a Mitchell overdrive….I could easily do over 100mph with that….then I wake up and come to my senses! Thanks for sharing Mike. Steve Pavich (new member with 1929 Murray and 1930 Briggs four-door sedans under restoration.